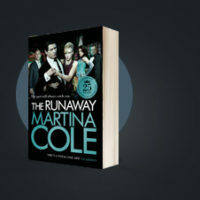 Martina Cole has had her novels adapted for TV screens and the stage, as well narrating documentaries looking at female killers and girl gangs. Here she tells us about what that’s been like for her. How do you feel when you see your books adapted on screen or on stage? It’s really interesting for me because I see my books in a new light when they’re performed on screen or on the stage. The actors bring something completely new to the character because they are visualising the story, rather than reading it. It’s exciting to see what was once just in my head turned into something visual. You’ve had quite a few of your books adapted for TV and the stage. Were you ever worried that some of your characters might lose the identity you’d given them when performed by an actor? I’m really involved in the productions and have been an executive producer and scriptwriter, so I don’t worry about that too much. And with the TV adaptation of The Take Tom Hardy was fantastic as Freddie Jackson. He was exactly as I’d pictured him. He spoke like him, he walked like him. It was surreal. Tom was Freddie Jackson! It was fabulous. Which of your books would you like to see on screen or stage next? Well, we’ve got a lot of things in the pipeline but we’re making a feature film of The Ladykiller at the moment, which I’m really excited about. It’ll be set in and around Essex. I want to be there for a lot of the filming. As well as having your books adapted for the screen, you have also fronted TV documentaries on ITV3 and Sky Factual. How did you find that experience? It was a bit nerve-wracking at first, being in front of the camera. I wasn’t used to that. But I got to work with my friend who is a producer, so that helped with the nerves and made it fun. It was a great experience. What has been the best thing about having your books adapted for TV and the stage? It’s wonderful to see your characters and your stories from a different perspective, and to see an actor’s or director’s vision of your book and how they bring that to life. But the really great thing, particularly with the TV adaptations, was how actors’ performances, like Tom Hardy’s, brought so many new young male readers to the books and encouraged them to read. I loved that.